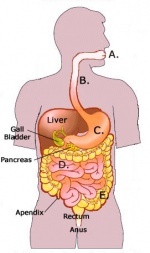 The digestive system is where digestion occurs. Digestion is the breaking down of chemicals in the body, into a form that can be absorbed. It is also the process by which the body breaks down chemicals into smaller components that can be absorbed by the blood stream.